So, full disclosure, I'm writing this review because this book has been at the shop way too long and it needs a home. 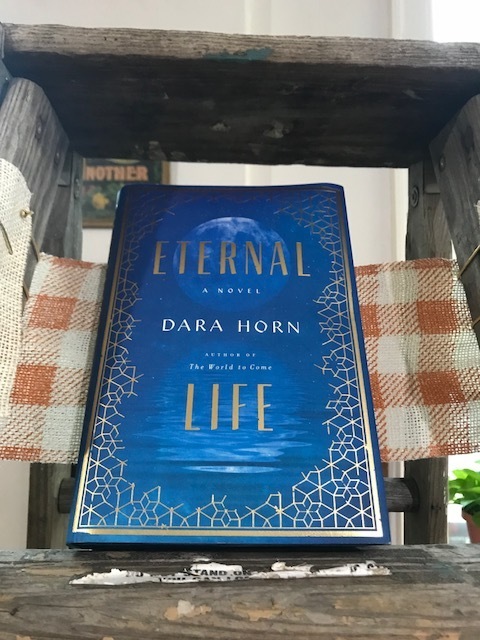 If you haven't read Dara Horn, this is a perfect introduction to her style, but also it's just a great book. Part sci-fi, part love story, part historical drama, this book has something for everyone, not to mention, it's timeless. a world ruled by capital G God, of temples, and priests, and holy scholars, Rachel can't help her desire to rebel. It's sparked from love, a thing that did not belong to women to choose for themselves. But when the baby she bears through an affair develops a life-threatening illness, she's forced to turn to the religious pillars of her community for help. And so the curse begins. Rachel trades her own life--her death, rather--to save the life of her child. The thing is, Rachel can't die, no matter how much she wants to. Instead, she's constantly reborn, smooth and fresh and young as she was when her first child was born. So too is the father of that child, Eleazar, who pursues Rachel from one life to the next, convinced that if their bodies can stand the test of time, their love must also be as potent. While physically, the heat is on, Rachel can't bear constantly being reminded of the greatest mistake of her life even if she's orgasming her way through it. More than that, Rachel can't bear the loss of the thousands of children who've moved from her world onto the next. She simply can't give birth to another child and watch them die. So, does Rachel find a way to do herself in, or does her genius granddaughter some how discover a cure to death--a plot point that keeps Rachel on her toes? Come buy this lonely book to find out! It's the perfect book for mothers, for religious scholars, for fantasy buffs, and for anyone who wants to own something that simply will never get old, just like the book's charming protagonist.